Yep, it’s that time again. Time to downsize, to purge unused belongings in order to keep my life simple and avoid being weighed down by stuff. Lucky for you that means I’m giving away a bunch of great books! 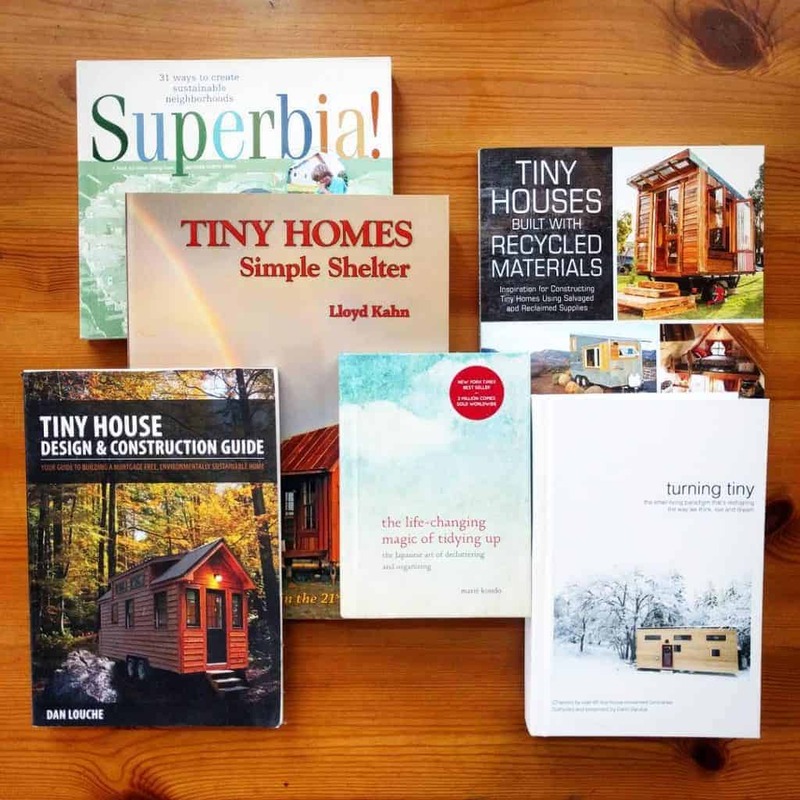 Enter below, and you can win all these great tiny houses books. Good luck! When you sign up, you’ll also receive two free guides: Tiny House Living, and Tiny House Utilities. If you’ve signed up in the past, you don’t need to sign up again (unless you want to, silly). When you share it, the visibility must be set to “public” so all can see it, not just your friends or followers. In your comment you must provide the URL of the page where you shared this — that’s the only way I can check to see that you did it. ALSO, you must tell me why you need these books and what tiny living goals you hope to achieve in 2017. I know: 3 steps is a pain! But it really only takes 15 seconds. Do it now and all these books could be yours! At the end this month, on January 31st, 2017, one winner will be randomly picked from all those who have met all three of the above requirements. I will contact the winner via email to get their shipping address, and will package and send the books right away! I shared this page in spanish so more people can get to your amazing material! I’ve been thinking on creating a small village of tiny houses for some time… a lot of free space with small efficient houses. Shared! I am so obsessed with the tiny movement. I want to live by experiences, not things. I want to travel and feel great without the burden of stuff weighing me down!! I have been designing my own house on paper and researching innovative storage options. I can wait to build my own!! I will start building mine asap…and i still need as more information about everything as i can. I am hoping to majorly downsize, getting my husband on board with getting rid of stuff seems to be an issue, I am trying to lead by example. I’d like to read these books and pass them on. Currently I’m educating myself on construction and tiny living so I can be prepared when the time is right for me to make the transition. (And then pass them on like you’re doing for someone else to learn and pass them on. I love paying it forward!) Thanks for doing this! My husband and I are in the process of down sizing / minimizing. We have been interested in tiny homes for quite a while, so these books would be much appreciated! Thanks for all you guys do!!!! In the downsizing process already – Thanks to Marie Kondo, don’t really need a wardrobe anymore and 6 mugs are plenty – who needs 27? I’m in the process of creating my vision of my tiny house at the moment, clever inspirations are more than welcome – and of course books would be passed on later…..
Congrats Randall! You’re the randomly selected book giveaway winner! Check your email (I’ve asked for your address to send the books). Enjoy! This came to me in an email, at https://tiny-project.com/massive-tiny-house-book-giveaway-2/?mc_cid=a55784be56&mc_eid=52aa507d26. I would love to win these books. They would help my plan my dream. I love to read and I have been researching tiny houses for a couple of years It is my dream to build my own tiny house one day . My goal for 2017 is to have more of a plan on paper with drawings ,Cost & all of that figured out then the next step would to be to find some $ to do it. My husband and I are working on thinning down our possessions and downsizing. While I don’t think a ‘tiny’ tiny house is in our future, I do believe a small house is. I have read two of the books included in your book-bundle offer and would like very much to read and digest the rest. Thank you! Those books would be an awesome addition to my toolset, I’ve been planning my Tiny House over the last year and I’m working on getting enough money to start building it. Thanks for sharing! Hello There from the Great White North! My goals for 2017 with going Tiny is I will be starting my floor plans, so I really need the design and construction book! Also, I am working with a few individuals on creating a sustainable community so the Suburbia book would be absolutely perfect! I’m so excited about this giveaway! I’m tiny house dreaming right now. I have spent the past few months combing the web and generating a very large Evernote notebook full of plans and ideas. We are still a family of 6 but our twin daughters are turning 18 in April. We are looking to build or purchase after they move out hopefully in the fall. We have two more kids so finding a THOW for the four of us is my goal. Hopefully 2017 will be the year that we live tiny! I shared this page on Facebook at https://www.facebook.com/zschoppa/posts/10210327462256865?pnref=story. I’ve been looking into tiny houses for years now, but I’m still in the design phase since I’m not out of school yet. This year I’m hoping to finalize my design with my girlfriend, and start seriously looking for land and material suppliers! In addition, I want to start designing tiny houses for my other friends and family who are interested! Hello, I have been excited about the tiny house movement for the last couple years. Growing up taking trips in small campers, I’m used to smaller spaces. I’d like to add these books to my collection so I can start building my tiny life for real! My tiny goals are to clear out and pair down the unnecessary junk this year, and maybe start gathering supplies to build my own tiny paradise. Hi Alex. Thanks for putting together such a great giveaway to your readers 🙂 I posted this on Facebook: http://www.facebook.com/bendetta/posts/10154249360289033 and if I get lucky and win, the info in the books will definately come in handy, seeing this is the year my fiance and I had planned our Tiny House build. I have been preaching the benefits of Tiny Housing as a partial, short, mid and long term solution to Homelessness and Housing. Here in Canada! I would like to have yoyr books because I am in not only the design process but the downsizing process also. I just found out i have to have major foot surgery done so it is pushing my time schedule way out of wack (grrrr). Maybe during the recovery i can be more focused on getting clearer in perspective what I need to get done. When this home is done. I will be using it to do missionary outreach work helping folks who are homeless, vets, domestic violence victims and in sexual trafficking. I am going to use my home to go out and help others by doing Gods calling upon me. I did sign up again for my email [email protected] in Facebook I liked you again also. I do not know how to do the adfing of the url with my phone. I have a friend from church who is gracious enough to help me by drawing up plans other than that 5 seriously do not know who other than myself will be working on this project. I am turning 50 on January 20 this is my first home that I own by myself and no one will ever take from me, coming fresh from divorcing the man who assaulted me and threatened to kill me, having this home is the proudest moment next to my sons birth. I apologize for the length of this I am just proud and happy for my journey and everyone else’s stories of determination. Good lyck everyone, God Bless, Peace. There is no URL to share on my iPhone! Shared anyways..! I’m currently having my Tiny built and already used the book I ordered from you, the Construction book shown here! I’d love to have the rest as well! I am in Germany and building a 90sqf Tiny House inspired by Jay Shafer’s EPU. I would like to install a “tiny” Tiny House Library for potential tiny house builders over here. Your books would fit well in this library project. I am slowly planning my tiny! I just started an intense grad school program, so right now it’s slow and steady researching, but I will eventually start nailing down some specifics. Not only do I want to minimize, simplify, attain a better work/life balance and not kill the planet, but once I get out of school I will need a financial plan for paying back all of this debt!! I shared this on my Facebook page (couldn’t find the URL) but it’s under my name, Vivian V. Arrington. I plan on building my tiny house with my dad this year and these books will definitely come in handy! I’ve been obsessed with tiny houses and minimalizing my life for the last 4+ years and I’m so excited that the time has come to start building my dream home! I don’t have any experience building or have a fancy skill to contribute to the process so it’s going to be a learning process the whole way. But I am determined! ❤❤ Much love! We live in a 22 m2 flat with my husband at the moment. We both love minimalism and tiny homes. We are planning to build our own house this year. I would love to have these books for inspiration and new ideas! Our goal is to start blogging about our project and inspire other people to give a chance for tiny home! I shared this on my personal Facebook because everybody knows how much I love tiny houses! I’m still only young and just trying to get my life together, but I’m hoping to move my life in the direction that I’ve always dreamed: toward a tiny house and a small plot of land to have a huge permaculture garden growing along side my many dogs, chickens and bees. I think these books will help me move in that direction. Love your site!